The Congress chief's statement came hours after he met Parrikar, now Goa Chief Minister, at the state assembly complex in Panaji. "Friends, the ex-defence minister Mr Parrikar clearly stated that he has nothing to do with the new deal that was orchestrated by Mr Narendra Modi to benefit Anil Ambani," he told booth-level party workers meeting here. His statement came hours after he met Parrikar, now Goa Chief Minister, at the state assembly complex in Panaji. The Congress President, however, did not clarify whether the issue was discussed during his meeting with Parrikar, who is suffering from a pancreatic ailment. Gandhi made the remarks a day after he alleged that the "Goa audio tapes", cited by the Congress to attack the Centre on the Rafale issue, were authentic and that Parrikar was in possession of "explosive secrets" that give him power over Prime Minister Narendra Modi. Reiterating his charge against Modi over the Rafale deal, Gandhi said he has taken Rs 30,000 crore of people's money and given it to his friend Anil Ambani. "Why was a plane that costs Rs 526 crore bought at a price of Rs 1,600 crore? he asked. The youngsters of the country, the youngsters of Kerala-- they get only one answer. And the answer is that the Prime Minister of India is corrupt," he said. The Congress has been targeting Modi on the deal, alleging that the price of each aircraft was sharply hiked from around Rs 526 crore, negotiated under the deal during UPA, to Rs 1,600 crore and that the contract would help Anil Ambani get Rs 30,000 crore benefit through offset contract. The government has denied the charges and has accused the Congress of spreading 'falsehood' on the issue. Gandhi questioned the removal of the CBI chief even after the Supreme Court reinstated him and alleged that the prime minister did it to "protect himself" and "ensure that no enquiry is carried out" against him in the Rafale deal. "Why did the ex-president of France tell the press clearly that he was told by the Indian prime minister to give the Rafale contract to Mr Anil Ambani. I want to ask why was a man who has no experience in building an aircraft given a contract after it was snatched away from those people (Hindustan Aeronautical Limited), who are building the aircraft for 70 years?" Gandhi asked. 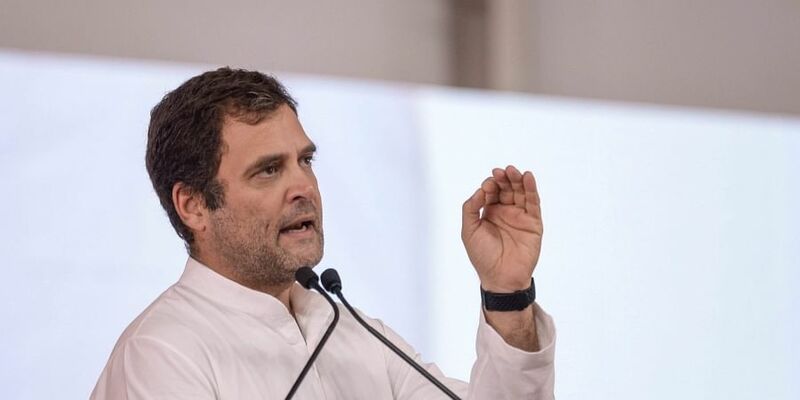 The Congress president said thousands of young Indians who could have got high paid jobs in HAL have now 'lost the opportunity. No defence capabilities were going to be built in India due to Modi's actions, he alleged.